Stay Frosty! Jaina is Brought into the Nexus! Between Warlords of Draenor, BlizzCon and other real life commitments, I haven’t had much opportunity to sit down and play Heroes recently, however this week I’ve managed to sit down and get a few games in – and it couldn’t have come at a better time! Jaina Proudmoore, Ruler of Theramore, has been introduced to the game shortly after getting showcased at BlizzCon, and she’s certainly shattered her way into being a quick favourite amongst many people! For those that haven’t played Warcraft, the Jaina we see in Heroes is at a time between Warcraft III and the events of Jaina Proudmoore: Tides of War – that is, while she still has her golden hair and as seen in the trailer above, we can assume that Theramore stands under her leadership. For more information about her, check out her lore article on Wowpedia as there’s simply too much to sum up here. She is an accomplished Mage that usually dabbles in all forms of arcane magic, though in Heroes focuses more on frost, rather than fire or arcane schools of magic. As such, she is a bit of a glass cannon when it comes to her assassin role in Heroes of the Storm (think even squishier than Nova or Valla) and really comes into play in team fights to control the fight and pick off anyone who’s bitten more than they can chew. As always, please remember that while writing this article, Heroes of the Storm is in technical alpha, and especially when the hero is new we may find that some parts of this spotlight may be old or outdated in the near future as balance occurs. Trait – Frostbite: All abilities Chill targets, slowing Movement Speed by 25% and amplifying damage from your abilities by 50%. Lasts 4 seconds. The bread and butter of Jaina’s arsenal. All of her casted abilities will Chill targets, which makes her chasing potential skyrocket for enemies she catches out. They most likely won’t escape, especially in late-game when she can spam Frostbolt every 2 seconds, so this also encounters a problem for Jaina players – if anyone’s caught by her, they either face trying to kite and juke or they’ll just turn around and smack her in the face. With a lack of escape options, you have to be good at the kiting game yourself or else you’ll get caught out and sent to the fountain. Despite the lack of escape in her basic abilities, she’s great at solo laning at the start of games largely because she can just chill any enemies coming toward her and hide behind the gates, and her Blizzard and Cone of Cold abilities can quickly decimate creep waves coming her way. [Q] Frostbolt: 30 Mana – Cooldown: 4 seconds – Deal 60 (+ 16) damage and Chill the target. A heavy single target nuke, though with the cooldown being 4 seconds at untalented and Chill lasting 4 seconds, when you’re not doing your shatter combo you want to follow up with Frostbolts after your other attacks. It is a skillshot that will stop on the first target it hits, be it creeps, heroes or buildings, so unless you’re great at threading the needle it is something to take into account when you go for your combos that generally, people will be hiding to save themselves from potential nukes. As such, there may be many cases, such as the shatter combo, where opening up with the Frostbolt is going to be the better option so that once you get the surprise hit in, the rest of your attacks can hit without worry about where they’re standing (unless it’s out of range). 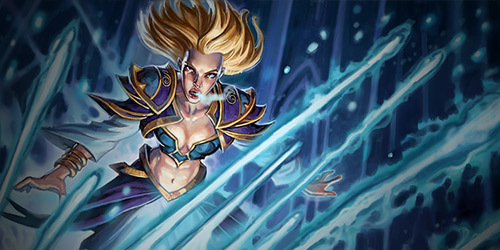 [W] Blizzard: 75 Mana – Cooldown: 15 seconds – Bombard an area with 2 waves of ice, dealing 40 (+15) damage each. Damaged enemies are Chilled. A wave clearer, but also great at grabbing escaping targets, this ability has more often than not granted my team kills from heroes that thought they were going to get away with it. Not always from the damage itself, but more because of the Chill it brings, allowing us to catch up and take the kill. Do note that the first wave will Chill a target, so if you can position it to hit a target twice, that second wave will crit. [E] Cone of Cold: 50 Mana – Cooldown: 10 seconds – Deal 40 (+13) damage and Chill targets. A quick nuke that is a short-range cone, I can never help but feel this ability could use some kind of buff to make it more worthwhile. Currently it’s mainly used to help clear creep waves and jungle camps, or to get that last nuke off if you find yourself in melee range. Similarly, it’s a quick nuke to get off so that you can escape if needs be if you get jumped. Overall however, I just feel that Cone of Cold is too small a cone and requires your enemies to be where you don’t want to be in order to make it useful. It’s certainly a nice addition to the shatter combo however, and I can’t think of many other iconic frost mage abilities that would help in this light. Maybe a Frost Nova for control? Frozen Orb? [R1] Ring of Frost: 70 Mana – Cooldown: 100 seconds – After a short delay, create a Ring of Frost at target location that deals 680 (224 + 24 per level) damage and roots enemies for 3 seconds. The ring persists for 3 seconds afterward, Chilling any enemies who touch it. The first heroic ability available to Jaina players is the Ring of Frost. Noticeably as annoying as the WoW version, with a massive amount of damage tied to it, it’s certainly my preferred talent in not just the shatter combo style of play, but just in general. Especially on maps where chokepoints are abundant, Ring of Frost will create so much space for your team in that enemies are just stopped in their tracks as soon as they see it coalescing, it’s hard to pick the Water Elemental over this. As much as the name implies it, please realise that the damage and root only applies to those hit by the actual RING of Frost, rather than the entire AoE inside the cast area. You can improve the talent at level 20 to make the ring pulse again for the area inside the ring, but the AoE is roughly the same size as Blizzard in that regard. [R2] Summon Water Elemental: 75 Mana – Cooldown: 80 seconds – Summons a Water Elemental at target location, dealing 170 (56 + 6 per level) damage and Chilling nearby enemies. The Water Elemental’s Basic Attacks splash for 25% damage and Chill. The second of Jaina’s heroics was the one I was more excited about to try out at BlizzCon, and was a little sad that it was the level 2 ability that you had to unlock after a game or two once she was available to play at home. However, upon playing both talents live, I’m really feeling that this one, albeit the “cool” option (no pun intended) is very lackluster in my opinion. Like Jaina, it’s also very squishy, and you can’t rely on games lasting until level 20 to make it mediocre enough to be viable over Ring of Frost and/or Bolt of the Storm. That being said, he can be useful for helping Jaina jungle, or to tank creep waves for her. In team fights however, the elemental will likely just get targeted and nuked down too quickly for how long that cooldown is. First of all, I’d like to preface this with the fact that I love what Blizzard have done with Jaina’s talents. If you needed any extra flavour carried over from WoW in terms of frost mages, this is where to find it. With talents like Icy Veins, Frost Armor, Arcane Intellect, Ice Lance, etc I do wonder if Blizzard will carry this theme onto other heroes like Thrall bringing Shaman abilities over as talents. In this overview, I’m going to focus mainly on the shatter combo, as I believe this is the most fun way to play Jaina in her assassin role. There may be small discrepancies between talents depending on battleground or team comps, but overall this is my general build for most games. At the start of the game, you want to be starting off with Winter’s Reach. The only other talent worth potentially getting is Conjurer’s Pursuit, but that’s only when you’re not comfortable with your regen and don’t know when it’s best to run back to fountain or moon well. Improving your trait isn’t as great in this tier because Lingering Chill is pretty much obsolete – all your spells Chill in any case so making it last longer won’t do much. For Deep Chill, if your enemies are getting away from you at 25% speed, you’re probably better off mounting up and chasing for a new chill anyway, or leaving to gank/push elsewhere. You’ll likely have other heroes in your team capable of slowing enemies baseline or have access to Shrink Ray. The extra range on Frostbolt will help in Jaina’s biggest weakness – being caught out in a bad place. Winter’s Reach will help scout bushes and get initiations done at a safer distance for Jaina to be at, and to turn around if things turn sour. At level 4, you’re going to be unfortunate in that you’ll have to have Jaina fully unlocked to get the full shatter combo out. Envenom is hands-down the best talent in the tier, allowing you to rot down anyone still standing after your combo and finish off the kill. Arcane Intellect again is a fairly good choice, similar to Conjurer’s Pursuit, if you just have the advanced talents as it will keep you on the field longer and allows more constant pressure outside of your combo. For level 1/2 Jaina’s, both Frost Shards and Snowstorm aren’t great talents to pick up, as it largely requires your enemies to have bad awareness. The targets for your shatter combo are preferably squishies, so Frost Shards could be a good pickup for those hiding behind creeps/Warriors until you get access to Envenom. Jaina’s of all levels have access to the best talent in this tier for her shatter combo – Frostbitten! As for the alternatives in the tier, Ice Floes isn’t too great because it upgrades Cone of Cold to not be too much better than it’s already used for. Enemies aren’t going to be clumped up enough to make the talent worthwhile. For Frost Armor, it’s ok for kiting but the second part of the talent isn’t great. The damage could proc off of a low damage hero like Li Li and then let the full damage of a Nova hit you. The block mechanic is great on Warriors that are designed to take hits, but you don’t want to be taking many if any hits on Jaina at all. Ice Lance is a fairly nice chasing/kiting tool, but it requires enemies to not be juking your skillshots, and requires the target to already be Chilled. For the shatter combo to work, you’ll be opening with Frostbolt anyway so Ice Lance’s utility is reduced significantly, especially in comparison to picking up the damage bonus of your trait. As explained above in the abilities overview, Ring of Frost is the best pickup here between the two, especially for the shatter combo. At level 20 the Wintermute talent may make the Water Elemental worth it, but it involves the game lasting until level 20 to make your mid-game talent useful. Plus, if you die then you can no longer direct your Elemental to go to places or kill specific targets – on top of the elemental itself being squishy. At least with Ring of Frost you’re almost guaranteed to get it’s full effects whenever you cast it. Level 13 has the most choice in the talents of any tier. If you’re winning, go for Icy Veins without a doubt. It’ll reduce the cost of your combo to allow you to continue pressure afterwards. If you’re losing, you may want to consider Improved Ice Block or Sprint – the former if your enemies will still be able to catch up to you or CC you when you’re attempting to escape with Sprint. Storm Front isn’t the best of talents for the tier, you don’t really need the extra range on Blizzard, only if people are running away from you. Otherwise you don’t want to state your intentions early with it, and it’ll be on cooldown for the shatter. The level 16 talents include one of the more important aspects of the combo, and actually makes Cone of Cold useful. Northern Exposure is what makes the shatter combo reminiscent of the frost mage combo – you have two seconds to make sure all your damage hits, AND it stacks with Envenom too. Snow Crash isn’t worth it in a non-AI game. There’s an AoE on the floor even before the first wave goes down. Most people leave by the second, and if they’re still there by the third… Get out of that MMR! For Numbing Blast, it requires to be clumped up after getting hit by a Blizzard for it to work properly, or you can root someone for a second to try and gain some distance. Ice Barrier isn’t too bad of a survival talent during team fights, but with better positioning you shouldn’t have too much need for this talent. The final choice again isn’t really much of a choice. I don’t really know why Swift Storm is here on Jaina, perhaps for lack of use for the other Storm abilities – she doesn’t do enough auto attack damage for Fury; she’s an assassin and they don’t seem to be targets to get Resurgence; and Shield is usually reserved to support. Bolt and Swift would have to be the ones that make the most sense for Jaina in that regard, though again I don’t see any scenario where Swift will be useful over anything else in late-game. I haven’t had a game last long enough to test Wintermute properly, so I can’t vouch for or against it for the moment, but between Cold Snap and Bolt of the Storm, I’d have to say I prefer Bolt in any situation. Used offensively or defensively to get into correct positions, this can either save your skin or make someone else have a bad time. I’ve mentioned the shatter combo a few times this article, and I guess I’d better explain myself here, now that we know what toolkit is available to Jaina. As we know, she’s a bit of a glass cannon and can control large zones of the fight extremely well. With this in mind, we can almost recreate a shatter combo like we see in WoW from frost mages – tons of damage in an extremely short space of time. At level 20 you’ll be dealing around 2/3 of a Warrior’s health in just a few seconds, so you can see how much you can remove from the fight and send your foes to the fountain. Start off with a Frostbolt to apply the Frostbite debuff, this is the hardest to hit spell if your foes are hiding behind creeps, so it’s easy to work out if you can continue the combo or not right here. As soon as the animation starts on the Ring of Frost, cast Blizzard. Finish up with Envenom to rot them down. That’s the shatter combo in a nutshell! As I said, practice does make perfect, so if you want to try it out against Arthas a few times in try mode, by all means go for it – being in such close range to get the Cone of Cold to hit makes it high risk, high reward so you don’t want to get your timing’s off or else it’ll be YOUR team in a 4v5 situation.